David Claud Graham Davies was born in Llanrwst in 1892. His parents were Thomas John Davies and Annie Louisa (nee Graham) who married at Weston Point in Cheshire in 1890. A younger son James Reginald was born in 1893 and it is possible that Thomas John died in 1894, aged 46. In 1901 census Annie L Davies head, widow, aged 35 was a Boarding house keeper at 25 Albert Road, South Manchester. She was born in Birkenhead. David was aged 9 and James 8, both born Llanwrst One of several lodgers was Hynek Zaloudek, a ladies tailor, born in Bohemia. Later that year Annie married her lodger and by 1911, she was living at 72 Mostyn St, Llandudno, N Wales. Two children, Robert and Herbert were listed, and stepson James Reginald Davies an engineering student aged 18. Hynek Zaloudek cannot be found. David (listed as Claude) was boarding with Alfred William Smith at 23 Charlotte Street, Rugby. He was aged 19 and, along with three other young men, was an electrical engineer at British Thompson Houston Co.
By the time the war started Claud Davies was charge hand in the Electrical Laboratory at the B.T.H Works. During his stay in Rugby, he distinguished himself as an athlete. He was a very useful member of the Rugby Hockey Club; he was a motor cyclist, and also distinguished himself as a runner, winning numerous prises at the B.T.H and other sports. He was very popular among his numerous friends. Whilst going through an electrical course at Bangor University, he joined the Officers’ Training Corps there, and got his certificate as a lieutenant. On coming to Rugby he, of course, gave up his connection with the corps; but early last year (1914) he received a communication from the War Office asking if he would care to join the Officers’ Reserve. He agreed to do so, was re-examined, and accepted. Subsequently he was gazetted as a second lieutenant, and was called to Woolwich early in September. He went to the front on December 11th, being attached to the 1st Siege Battery. David Claud Graham Davies 2nd Lieut 1st Siege Battery Royal Garrison Artillery died of wounds in the field hospital. He was buried in the Town Cemetery, Bethune. Previous to receiving his fatal wounds, Lieut Davies had several hair breadth escapes. Comrades had fallen all around him; his food even had been shot away, and he had had to subsist for a day on concentrated tablets. In his letters to friends he had expressed amazement that he should have escaped, but the communications to his mother were more guarded in tone. With the sad tidings of his death on Saturday came a letter, written on the 13th inst, stating that he was very busy and had had little sleep. He described a good meal that had just been provided, and said he expected to be fighting right through the night, and then would have a long sleep – a prediction that has unfortunately proved only too true. 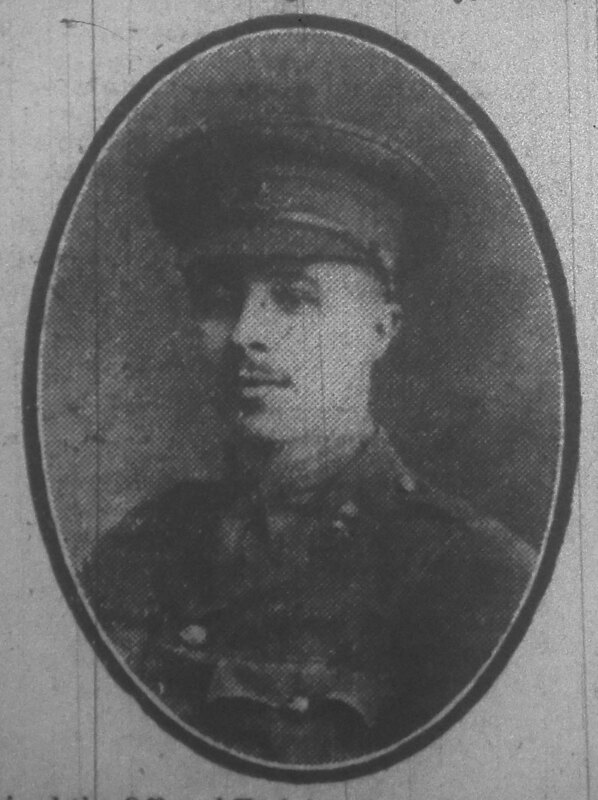 Second Lieut Davies was 23 years of age. He has a brother who is also at the war, but attached to a different battery. He was awarded Victory medal, British War Medal and 15 Star. His mother appears in early Rugby directories as Mrs A L Zaloudek, later as Mrs Davies of 15 Holbrook Avenue, Rugby. This entry was posted in Biography and tagged 1915, BTH, Davies, Royal Garrison Artillery by Christine. Bookmark the permalink. Claude is also remembered on Llandudno’s war memorial. He attended John Bright School before entering Bangor University where he read electrical engineering. He was a talented footballer and played for Llandudno, Leicester and Bangor University. He died from wounds after being hit by shrapnel while directing fire from an observation post. I have an image of Claude if you would like it? Hynek Zaloudek is buried on the Great Orme, Llandudno.